Cystic renal masses result from a wide spectrum of pathology including renal cysts, benign cystic lesions of nonepithelial origin, benign cystic neoplasms, and cystic carcinomas. Whereas the diagnosis of a simple renal cyst is easy, differentiation between complex cyst and cystic renal tumor can be difficult. Ultrasonography provides definitive diagnostic information in most simple renal cysts that are incidentally screened. Computed tomography (CT) is the gold standard in detecting and characterizing cystic renal masses. The Bosniak classification system is based on specific CT criteria that rely on the cystic lesion enhancement properties and morphologic features. This classification scheme has been designed to separate cystic lesions requiring surgery (surgical categories III and IV) from those that can be left alone (nonsurgical categories I and II) or followed (nonsurgical category IIF). MRI is now considered at least equivalent to CT in the characterization of cystic lesions. It also plays a major role in the diagnosis of category IIF cystic renal masses and those that remain not categorizable at CT. Contrast-enhanced ultrasound has also been shown to improve the evaluation of complex cystic masses. 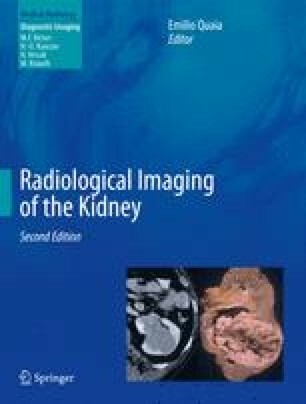 It can be currently proposed as an alternative to CT in the follow-up of complex renal cysts and in patients with serious contraindication to contrast-enhanced CT or MRI.